Energy saving solar window films could see annual savings of up to 30% with improved HVAC efficiency. Safety and security window films give both you and your guests peace of mind from wind-blown debris in storms and save you money on stolen goods in the case of a B&E. Decorative & privacy window films not only can be used to beautify your facility, but provide more privacy to your occupants. Energy efficient custom window treatments manage sunlight in any room, diverting blinding rays and controlling heat. Although we covered the contents of this eBook in the previous posts above, you’re welcome to download a free copy to share with others. 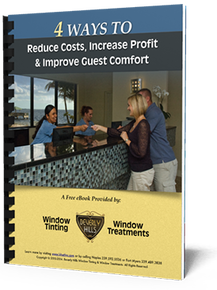 We hope that it saves you money and improves your guests’ comfort! If you’d like to see more examples of our products visit our photo gallery. If you’re ready to have any of our products installed, get a free quote today.